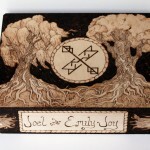 Emily Joy Walker from Emi.Nation practices pyrography, the art of wood burning. 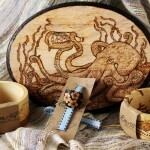 With her trusty wire-nib burner, she skillfully chars designs into bangles, rings, nesting dolls and other wooden items. Emily’s items reflect her respect for the natural beauty of the world and the depth of character she uncovers in her clients. I grilled her on inspiration, technique and even photography secrets. 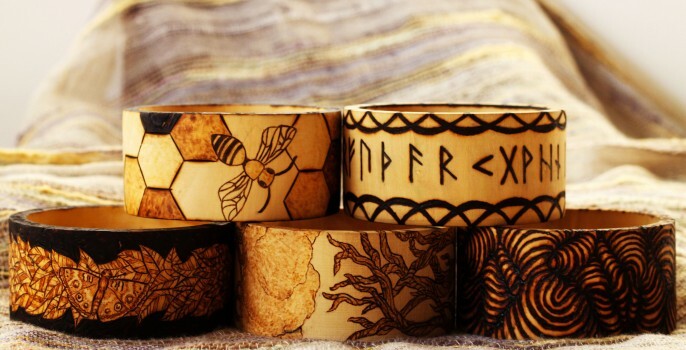 I’ve only met one other person who does pyrography. Where did you learn the skill? I’m entirely self-taught. My dad showed me how to make stained glass as a teenager; when I moved to Colorado four years ago, I could no longer work in the studio he built. I had my soldering iron and some glass, but not enough tools to continue my work. Frustrated at my incomplete studio, I decided to use my soldering iron to burn a sketch on a piece of wood. 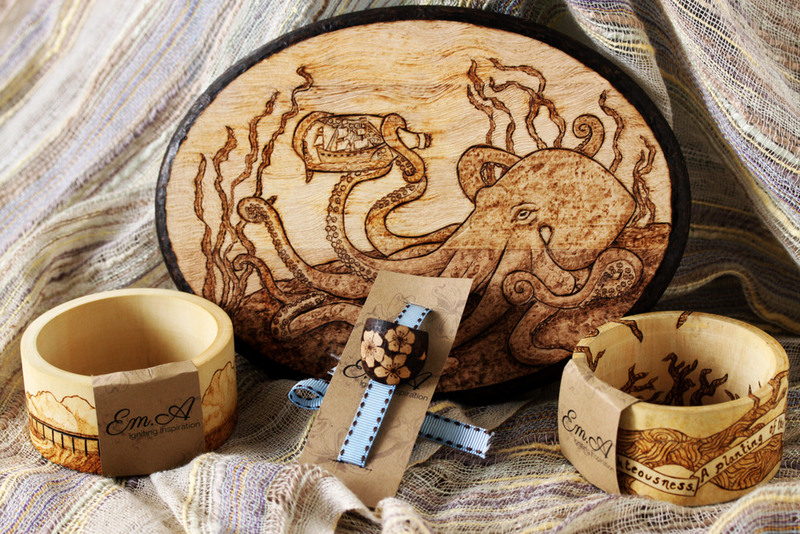 I hadn’t heard of pyrography, but I did some research and purchased my first basic kit a few months later. Now I work with a more advanced machine with interchangeable tips and a temperature control. Do you buy your wood pieces unfinished or make them yourself? I buy them unfinished from various suppliers, especially Etsy sellers. 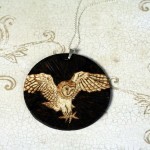 I like supporting other small businesses – I lack the skill to create such smooth, nice pieces. If I ever decide to enroll in college again, I’d go back to study wood turning and woodcraft to work every step of the process. It would be incredible to be the sole creator in my work. As it is, I’m very happy to help out other local artists and craftspeople! What is your process for creating an item? Do you find a piece to fit a design or vice versa? I’ve done both. If I’m buying a piece to fit a design, it’s probably because I have a commission and I’m seeking out the perfect item to display my customer’s vision. 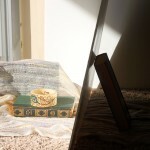 Normally, I purchase unfinished pieces and stare at them until an idea comes to mind for a design. I’ve purchased items because I thought, “Ooh, when I get an idea for that, it will be incredible!” A few of them are still on my shelf, but I’m confident inspiration will strike and I’ll be glad I acquired the piece. I love the color in the Peacock bracelet. Do you plan to do other color designs? I would love to. It’s a lot of fun and I think they look stunning if done correctly. I used color in many plaques and purses when I was starting out. Some of my favorite pieces, like my Sandman series commission, incorporated paint. It’s a time-consuming process, even more so than regular pyrography; I draw out the design in pencil, burn it, paint it, and then I have to go back and burn all of the surrounding areas to get crisp lines. My desire to create more pieces at a faster rate side-tracked my painting. How did you become interested in Elder Futhark runes? I’ve always been interested in history, the occult, and pagan imagery. My husband is of Norwegian descent, and we’ll often watch documentaries or read books about Vikings and other ancient societies. Since I was introduced to Elder Futhark runes, I’ve expanded from basic knowledge to drawing runes for myself and a few other people. I carry my antler runes anytime I travel – they’re my security blanket. Every time I touch and study them I feel like I’m connecting with ancient human knowledge. I’m drawn to their basic, beautiful shapes. My husband and I have lovebind rune tattoos from our marriage, designed by a runemaster. Each rune has an association with a letter in our alphabet, so he took our initials and created runes for each, bound with the lines in the middle. It’s my favorite tattoo. I’d like to burn rune sets, but I need to ensure that the wood I use is properly treated. There are guidelines on how to make rune sets that I’d really like to honor. Hopefully I can begin making them later this year. Your photos are fantastic! What’s your secret? Thank you! I’ve worked a great deal on it. I always try to tell other Etsians that they should focus intensely on their photography. Honestly, one of the most important parts of my photography was trusting Laura of Le Animale. She helped me a great deal with my branding. 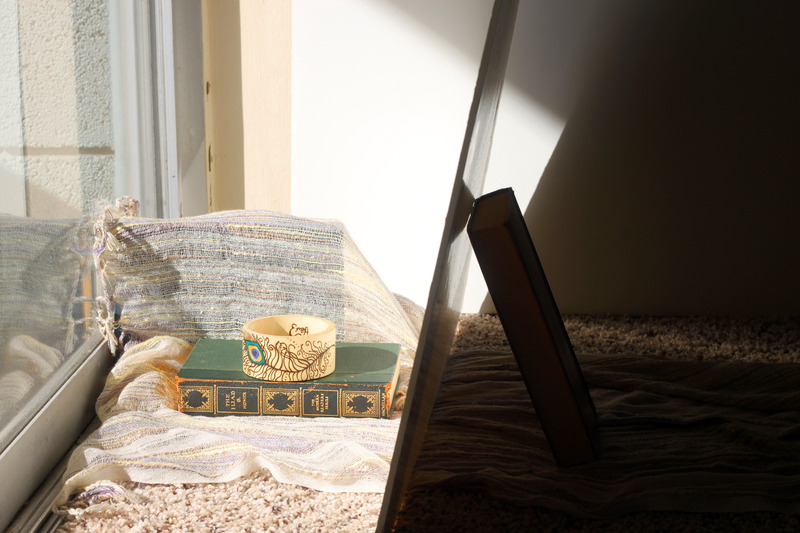 I’d been taking pictures of my products on stark white backgrounds; she sent me a few photography styles that she felt would better highlight the depth and warmth of the burning. Since then, I’ve made better use of natural light, experimented with lenses on my DSLR, and edited every single photo before posting. You don’t need a nice camera to take beautiful photographs – a skilled photographer can make an iPhone photo look like a piece of art – but each photo should be edited, even if it’s in a basic program. I will admit, I love my macro lens. It’s helped me capture the details I couldn’t get before. It was vital once I expanded to rings – they were too small for my other lenses. A Rebel Alliance ring but no Empire design? I see where your allegiance lies. Ah! No! I love both sides equally. I was raised on the best trilogy for movies: Star Wars, Indiana Jones, and Batman – but Star Wars was always my favorite. I insisted on being Princess Leia for Halloween almost every year in elementary school. I’ve always been drawn to the dark side, too; how could you not be captivated by Darth Vader? I’ve even debated getting a small Galactic Empire tattoo. I have to admit, my first crush when I was five was on Han Solo. I thought he later flew to earth and changed his name to Indiana Jones, which explained how he was so skilled at everything when he was just a professor! I still swoon to this day. What are your favorite sci-fi/fantasy novels or movies? Wow, that’s like picking between children. I’m a huge bibliophile and have hundreds of novels in my apartment. I love epic fantasy novels that span at least three books, so I can watch the characters grow and learn. My favorite novels are the Kushieline Series by Jaqueline Carey – so much so that I have a tattoo based on the books. Wayfarer Redemption by Sara Douglass is one of the most engrossing, brutal series I’ve ever read. Arthur C. Clarke is probably my favorite sci-fi author – Childhood’s End is fantastic. I can’t get enough of HBO’s Game of Thrones. I haven’t read the books yet; I’m afraid I might criticize the series too much – but when it is done I’ll dive right into the novels. When making pieces with a dark background, what’s your technique for the dark areas? I favor one or two specific tips, turn up the temperature, and brush it over the background. I haven’t used any particular pattern for it. The most important part of doing the backgrounds is patience – it can be the longest part of the process and isn’t as engaging as the detailed parts. 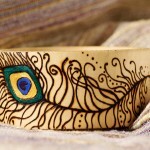 I imagine that pyrography is pretty unforgiving; is a piece totally lost if there’s a mishap? It’s true, burning is difficult to correct. I have a few solutions for minor mistakes. Sometimes, I’ll adjust the design to fit the accidental line. I can also use a fine-pointed glass etcher or sand paper to help minimize or erase the mistake. It depends on how deep the burn is in the wood. I’ve yet to lose a piece, but I’m sure it’ll happen. It’ll be a dark day – haha. 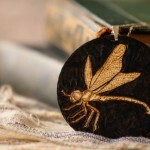 Have you considered teaching pyrography? You know, I haven’t considered it. I’m still relatively new at it, going into my third year with no formal training, and I feel it would be best to gain more experience before I branch into teaching. Bigger and better stuff! As I mentioned, I’d love to get back into color pieces. I’ve always wanted to do large wall pieces. A piece like that would take months with my current schedule, but I think it would be so rewarding! Currently, I’m working on a commission for a sake set. 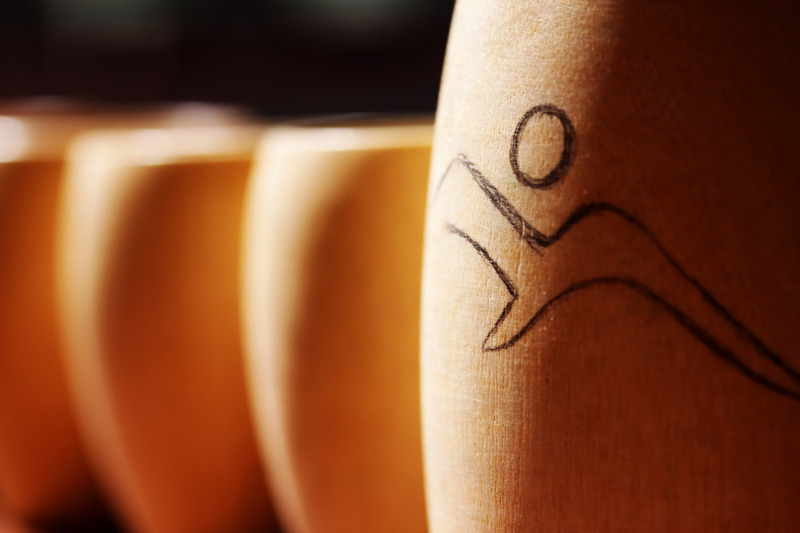 If the wood burns well, I’ll probably roll out a line of sake sets! Emily, if you decide to start teaching classes I’ll be the first in line! Emi.Nation is always evolving; keep up with Emily Joy on Facebook, Twitter and Instagram. I adore her progress shots, inspiration, and connection with customers; good stuff.